A matched dining set is just fine. But sometimes, your chairs wear out, you come across the perfect table at a thrift store, you move house and your old things don’t fit… or you just want to create a fresh and creative look in your dining area. If you’re feeling inspired, look at these examples of mixed chairs and tables to see how you can create a space that is unique and beautiful! You can make a big statement by using a furniture piece of a completely different style from the rest of the room, but usually, it works best to balance contrast and connection. That is, the contrast of different materials, colors, and forms creates visual interest, but connections, or common elements between pieces in the room will pull the look together. Here are some examples that blend modern style with a comfortable, homey look. I look at more traditional spaces in a companion post. 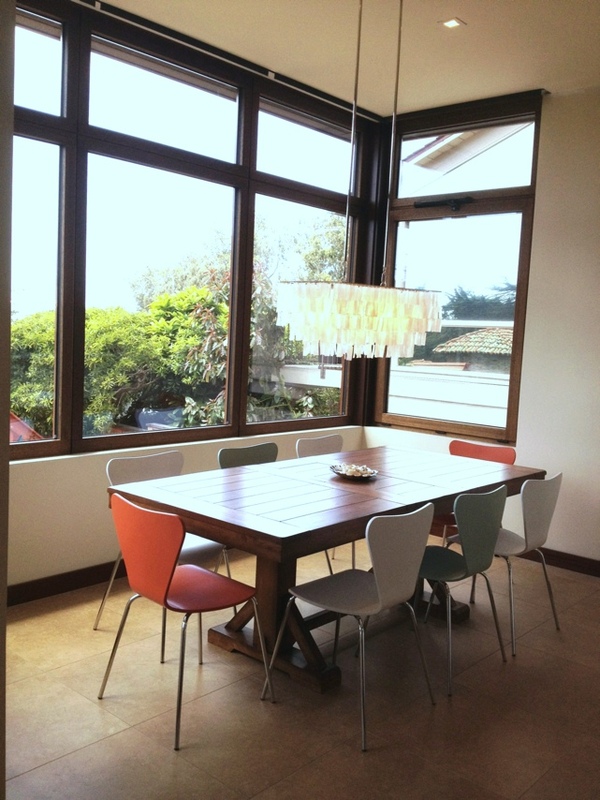 This is a fresh and airy dining area from Hanna’s Room. The natural wood of the table stands out in a space that is otherwise all white. Its simple straight lines form a backdrop for the curvy chairs. The bare bulb pendants and modern white chairs feel crisp against the other soft, worn surfaces in the room. White is the obvious theme in this room, found in the walls, floor, curtains, chairs, and other accessories. The wood table is simple enough that it doesn’t overpower the rest of the room, and the material ties into the wooden floor planks. This wooden table works perfectly in a clean white space by providing a contrasting material and color. Its clean lines fit with the modern design, and the wood relates back the painted wood floor. From Hanna’s Room blog. The warm red of the chairs contrasts against the distinctive white tulip table. Both the red and white provide interest against the wooden floor and wooden sideboard. All the furnishings in this room have a mid-century style. The round back and mid-century style of the chairs works perfectly with the tulip table and warms it up considerably from the cool space-age look of a complete tulip dining set. The red color is echoed in the pot and vase, and the white blends with the white walls and ceiling. This distinctive white tulip table was paired with red wooden chairs. The circular back of the chairs and the mid-century aesthetic tie them together. The chairs are a beautiful accent in this room. From Quiest-Brooke. The two rooms above were part of my inspiration in creating the dining space in my dad’s beach house. This home is built with modern straight lines, but with an emphasis on natural materials, like the mahogany trim. As a coastal vacation home, it should be warm and inviting, too. There are many wonderful sources for rustic wooden tables – flea markets, Craigslist, thrift stores, or furniture manufacturers that make tables from reclaimed wood. I ended up buying a new table that still has that aged look. It’s the Antique Honey Verona table from Cost Plus World Market. I like the trestle style for its looks and for easy of seating (no bumping up against the legs of the table!). You can see in the picture below that Cost Plus paired chairs with a bench, which is another great way to add interest to your dining set. It’s still a lot of wood in the same color, though, and the look is too heavy and rustic for our space. I chose to pair this rustic table with Jake chairs from Room and Board. These are very similar to the ones in picture from Hanna’s Room. I’ve seen the same style for literally ten times as much money from other sources, but I couldn’t tell you why. I was inspired to add some color after seeing the red chairs in the picture from Quiest-Brooke, so I got the Jake chairs in coastal-inspired white and blue, with two orange chairs for a fun accent at the head of the table. I still haven’t decided of three different chai colors is too much, so I took some pictures with and without the blue chairs. I could spray those white. What do you think? Here is the dining space in my dad’s beach house. I feel like it succeeded in blending modern features with a comfortable, coastal style. The chandelier is from West Elm. I don’t think the room needs anything more, though I might find or make a piece of art for the wall. The antiqued wooden table adds a rustic touch to the new and modern space. 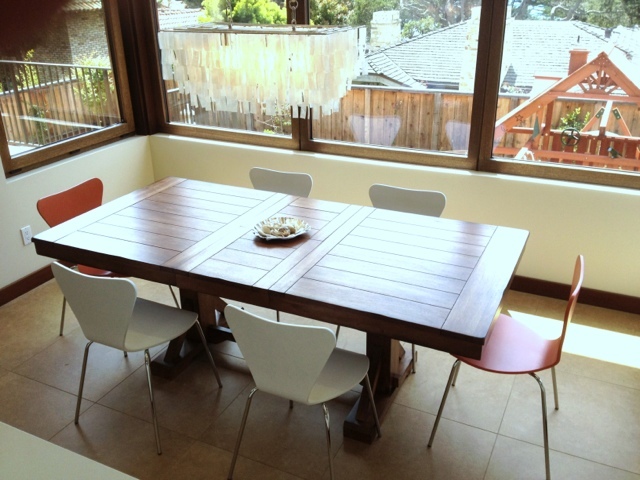 the orange chairs at the head of the table add interest next to the white chairs. 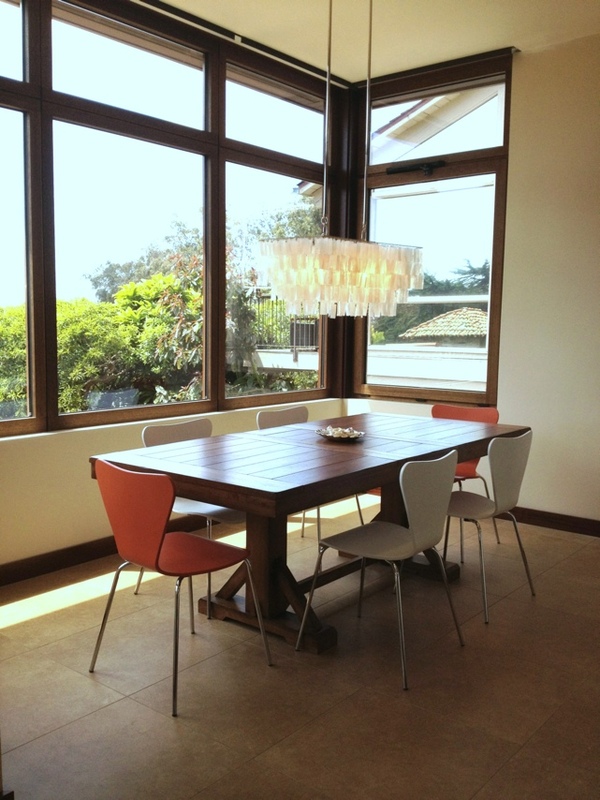 The modern lacquered chairs contrast with natural materials in the table, chandelier, and window trim. The wood table echoes the wood in the trim. The chairs are all the same style, although they have different colors, and those colors are found in other parts of the room as well. The chairs, table, and chandelier all refer to the ocean in the material, color, or form. Although the style is completely different, I also have a mixed dining set at our house, where I painted and reupholstered our Ikea chairs. I talk about examples from that room and other more traditional spaces in the companion post: Perfectly-Mixed Traditional Dining Rooms. I hope you feel inspired and emboldened to create your own unique and exciting mixed dining set. As long as some elements – shape, material, color – tie into your space, you’ll end up with a look that’s striking and cohesive.